Setting up UAG in a DMZ requires at least a minimum degree of coordination and collaboration between VDI admins and firewall guys. Sometimes this coordination doesn’t come easily and it can make for a very frustrating experience deploying UAG. While most VDI admins aren’t in a position to hop onto the network equipment themselves and fix it, there are steps they can take to help diagnose and narrow down network issues. I recently discovered two techniques that provide VDI admins with more independence when it comes to confirming port connectivity requirements have been met for their UAG deployments. The first involves using curl to confirm TCP port connectivity between the UAG appliance, the Connection server and the virtual desktop. 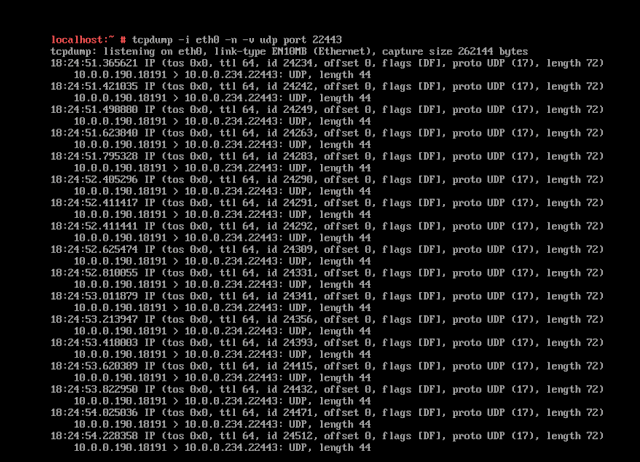 The second involves using tcpdump on the UAG appliance to confirm receipt and transmission of UDP traffic. 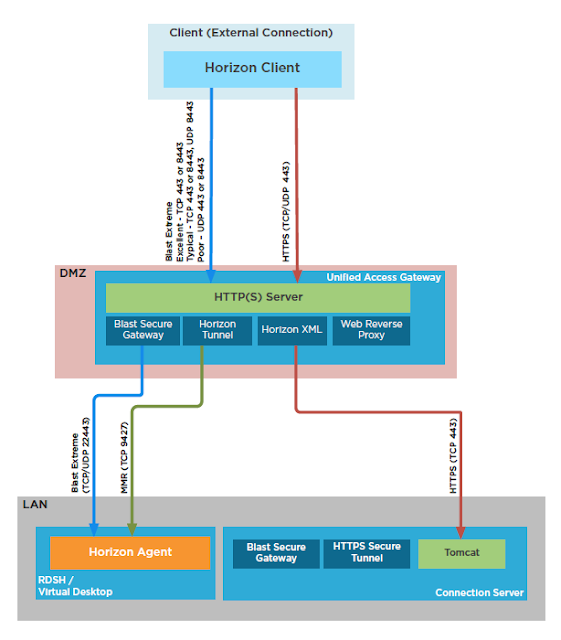 If you’re interested in an excellent overview on UAG and Blast here are the official goods, Blast Extreme Display Protocol In Horizon 7. 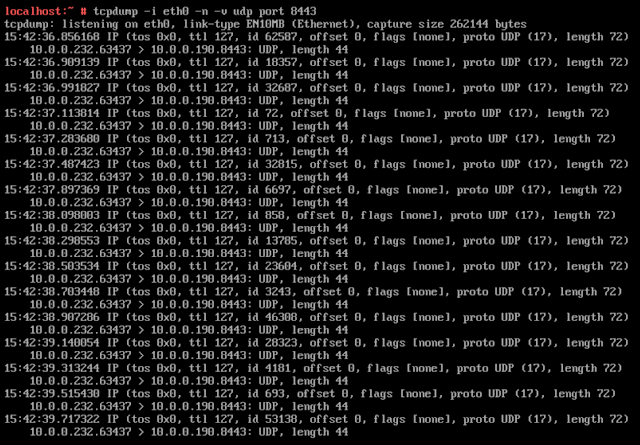 Otherwise, following are the specifics of using curl and tcpdump. But what about confirming port connectivity from the UAG appliance, through the internal firewall, to the virtual desktop or the Connection server? Well, you can log directly into the console of the UAG appliance and use curl to run telnet against the connection server or virtual desktop. With these two curl commands you’ve confirmed TCP port connectivity from UAG to both the Connection server and the virtual desktops. Combined with the successful port checks for external facing ports, you now know you have the port connectivity required for successful TCP based Blast communication and successful connections should be possible. 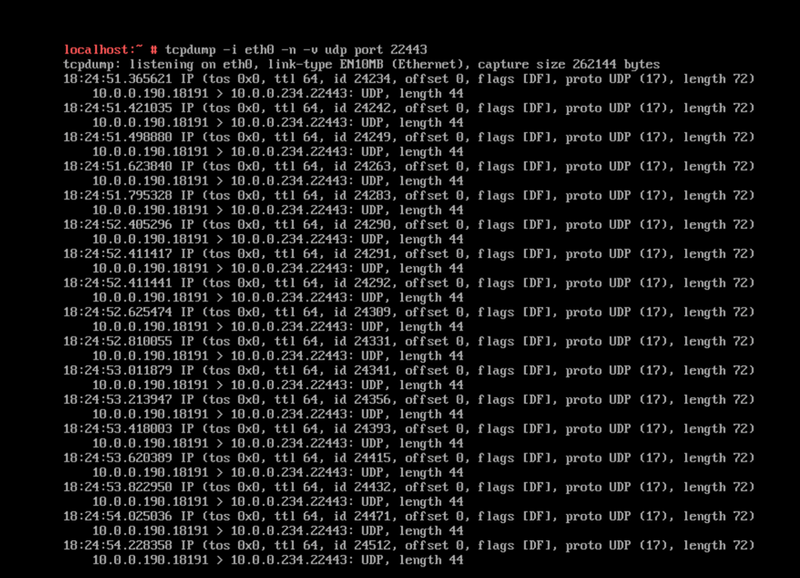 Now for UDP. With the above example, Blast initially sent a handful of packets to UDP 8443, then failed over to TCP because of UDP connectivity issues in the internal network. Regardless, we’ve confirmed that UDP 8443 is being received on the external interface. 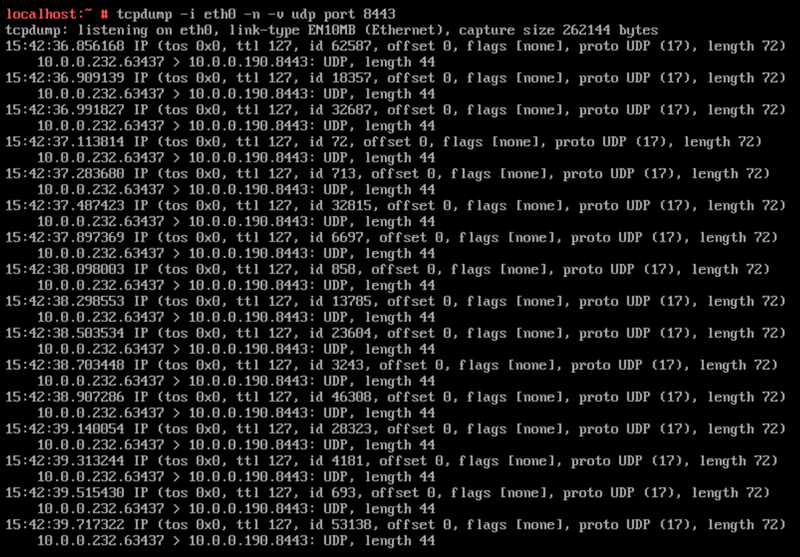 If no 8443 packets had been seen, we’d know there’s an issue with 8443 UDP getting blocked somewhere. 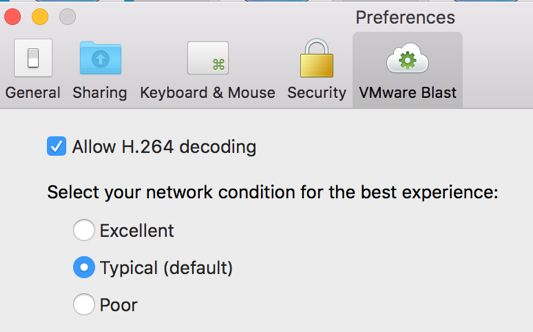 Then we can initiate a connection with the Horizon client using the, “Typical,” network setting. 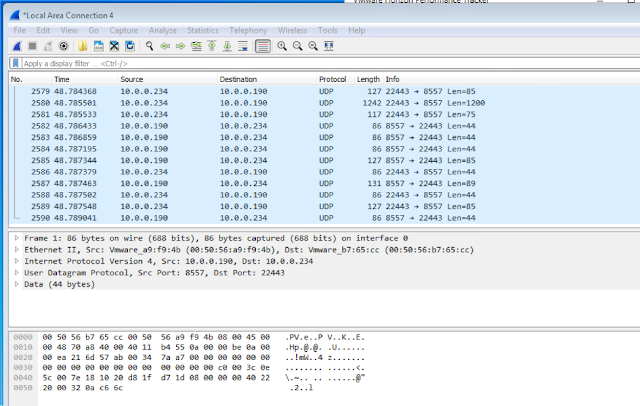 If you run Wireshark on the destination virtual desktop at the same time, in parallel to all this UDP traffic displayed on UAG, you’ll see the UDP traffic making it to the destination desktop. The Horizon connection has given up on using UDP for this connection and has fallen back to TCP. You can confirm this behavior hitting ctrl c and then search for TCP transmissions. 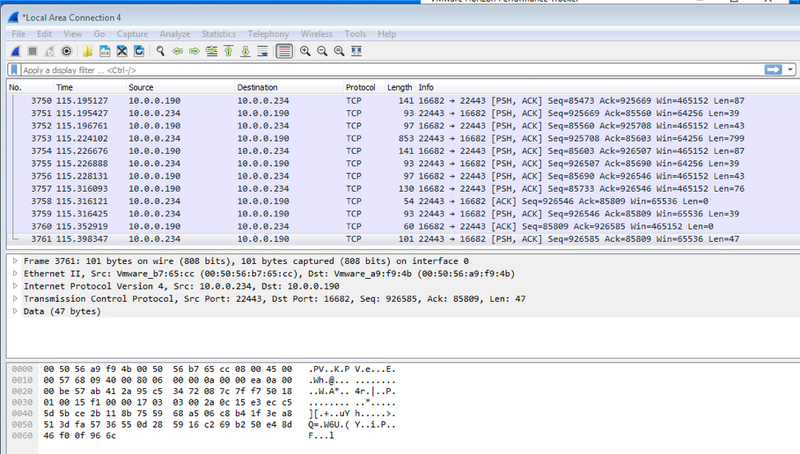 You'll see the client continuously sending packets over TCP now. 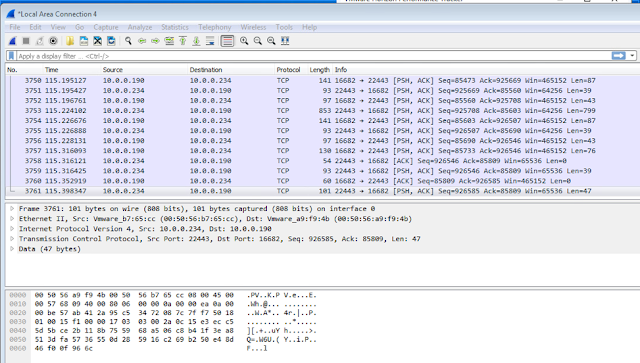 Also, by looking at Wireshark on the system, you’ll see that only TCP packets have made it across to the virtual desktop, no UDP. Along with the techniques detailed so far, you have some other basic but very nifty network commands at your disposal from the UAG console. You’ve got the ability to run good old fashion pings from the UAG appliance, as well as nslookup. So, from the UAG console not only do you have curl and tcpdump at your disposal, but also access to the same basic network troubleshooting tools most of us are used to working with.